If you’re like many, January has kicked off with a flurry of diet and exercise. But why make all those New Year’s resolutions about you? Commit to giving your home a makeover for 2019, too, by trying out one or two of these interior design looks from the annual 100 Pinterest Trends. Here are just five of the styles highlighted on the Guest of a Guest blog that will instantly add a fashion-forward flare to your living space. Think Yellow. Mustard yellow, to be exact. If you’re a fan, paint an entire room in this deep golden hue, otherwise, incorporate the trend here and there with pillows, ceramics, or linens. Plant walls. 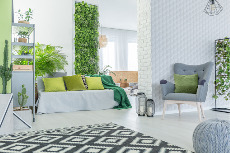 You may be noticing these vertical green spaces in your favorite trendy restaurants or coffee shops, but now you can bring the look right into your home. Use real or artificial greens in one section of a room to create a plant wall that stretches from floor to ceiling. You’ll instantly bring the outdoors in and give any room in your house a fresh and vibrant feel. Textile art. Think macramé wall hangings reminiscent of your favorite ‘70s scene, or woven wall coverings. The look adds a warm, Bohemian vibe to your living space, and blends well with just about any of your existing décor. Painted geometric wall collage. Pick up some painter’s tape and a few cans of paint, and spend an afternoon turning a wall into a design statement. Pick your favorite shape—triangles, rectangles, hexagons, you name it—and use different shades of one color or contrasting colors to make a soft or psychedelic statement. Wallpaper. From textured finishes to dramatic patterns, wallpaper has made a comeback. Use it to show your personality on one wall or an entire room. The look you create can run the gamut from soft to sophisticated to funky to elegant. Having fun with these design trends can add style to your home without embarking on a major overhaul. And when you’re ready to change things up, you can do so with ease.